This Wilmington, Vermont homeowner contacted us because he had a crawlspace with clear signs of water and mold. He wanted to seal off the area to make it clean and dry. Matt Clark's team of installation specialist placed a SmartPump System with a discharge line that included an IceGuard and LawnScape and a full CleanSpace System with drainage matting and a liner to prevent any water from entering the space. This helped to close off any moisture and mold from the home and storage area, to make the crawlspace usable. The customer wanted their basement dry and to turn it into a usable space. To accomplish this Matt Clark's Northern Basement Systems installed a Full Perimeter Water Guard System and a TripleSafe SumpPump. The WaterGuard will go along the perimeter of the basement collecting any water seepage or static pressure water. It will then direct the water to the TripleSafe Sump Pump, where it is discharge out of the basement, away from the home. A customer in Keene, New Hampshire was looking for a solution to fix their nasty wet crawl space. They contacted the professionals at Matt Clark's Northern Basements Systems, for a permanent solution. Matt's expert production team installed a CrawlSpace Encapsulation System with a SaniDry Sedona dehumidifier. They also sprayed closed-cell spray foam to all of the rim joist around the crawl space. The homeowner now has a dry, beautiful crawlspace. When the old support beams where not safe for full I beam support the homeowner in Walpole, New Hampshire contacted Matt Clark's Northern Basement Systems. One of Matt's System Design Specialist came through with a permanent solution for supporting the i beam. Matt Clark's Northern Basement Systems installed four SmartJack support beams to fully support the I beam. 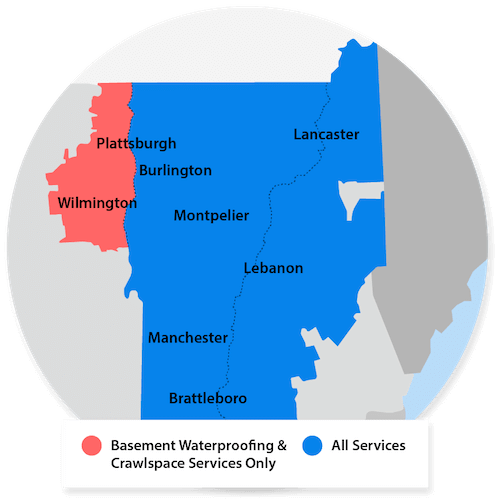 Matt Clark's Northern Basement Systems took a very wet basement in Walpole, NH and turned it to a permanently dry basement in just a few days. They installed a twp stage, DryTrak & Lateral Combo, waterproofing system and a TripleSafe Sump Pump.